It is very complicated to manage schedule on daily basis. If you are searching something that will give you alerts and reminders about your next activity then you are in the right place. 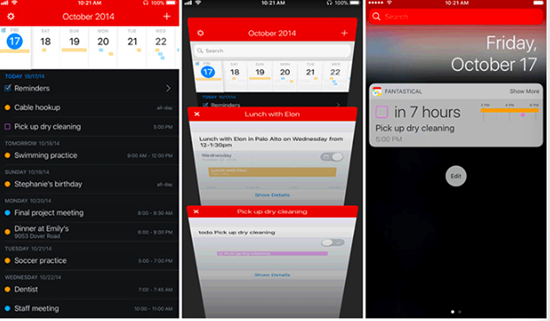 We have listed the 10 best calendar apps for iPhone and iPad. These apps are easy to use and show the date, help us to set alarms and reminders for anniversaries and birthdays and even help us save to-do lists and notes for remembrance. There are many calendar apps that are available in the market, and the listed apps below are the best as per the users’ ratings and reviews. Tips: If you lost any important reminder or calendar from your iPhone, you can always use the professional Gihosoft iPhone Data Recovery tool to get back deleted reminders and calendars for free even without backup. Calendar 5 is the most popular calendar app on iPhone which supports many languages, and helps you to create events very quickly. With the help of this app you can control, create and track your tasks. If you want to use this app then you have to pay for it around $6.99. This app gives you the options to create, edit and delete you tasks even when you are not connected with the Internet. You can get updated with reminders which will alerts you for your upcoming meetings, events, party and lot more. Tiny Calendar has very attractive UI which makes a good impression when you get started with it. 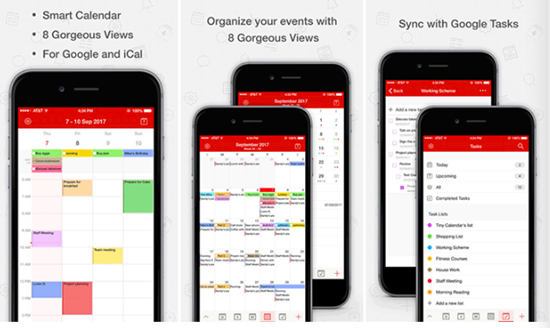 It helps you to manage and control your calendar events with aplomb on iPhone. It has some special features like, it supports many languages, and gestures, such as drag and drop, and it also allows you to managing the task as well as creating events in a very easy and simple way. Tiny Calendar is free on iOS App Store that you can download and mange your schedules like a pro. This iPhone calendar app offers 8 different modes such as days, weeks months, 4-days together, years, etc, which will help a lot for iOS users. By this calendar app you can manage your tasks in a very easy and simple manner. You can edit the task in the batches, and it also allows you to colour code your tasks to ensure the most urgent reminders catches you attention quickly. If you want to use this app then you can simple download it from the App Store with around $2.99, which is very cheap amount for this app. 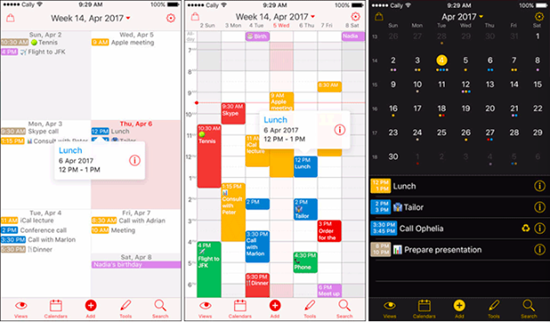 Fantastical 2 is one of the best calendar apps for iPhone users, which helps you to manage your events in the easiest way. It is a paid app and you can downloaded this app from the App Store with the cost of $4.99 . It helps you to be punctual and the reminders alerts you for your each task from your to-do list. You can also set the reminders for your arrival and departure for an event. 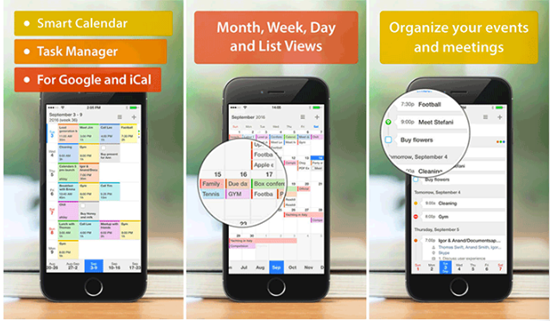 This calendar app has two main features, you can schedule your tasks and plan your activities. 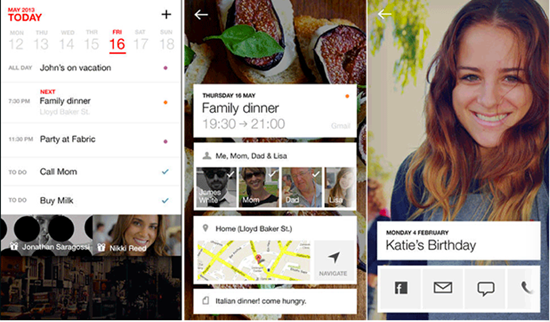 You can add reminders in just few taps according to your plans. This is a paid app you can download from App Store and it will cost you $1.99 . It has several colour themes by which you can customize the app according to your desire. If you want to use this app at night or in a low light conditions then it has a night mode which helps you to protect your eyes. Google Calendar is the best calendar app you can try on iPhone, for it helps you to create, manage and track events. It will also suggest you things to complete the tasks according to your events’ title, place and people. This calendar app syncs events automatically from the Gmail. To checkout upcoming event you can change the view to day, week or month. Google Calendar also supports many languages including English, Bulgarian, Catalan, Croatian, Czech, Danish, Dutch, Finnish, French, German and many more. The best part is it is a free app. 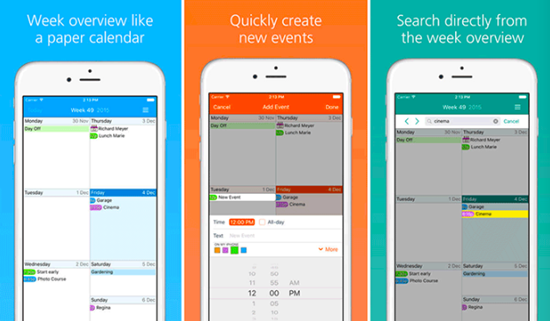 Awesome calendar is a very simple and easy-to-use calendar app on iPhone. It will also show you the weather in your area which will help you to plan your day according to the climate. It comes with built-in note maker and to-do list, with a number of ways to display information. It has very simple User interface which makes you look forward to manage your calendar. It is paid app which will cost you $9.99, and you can download it from App Store. 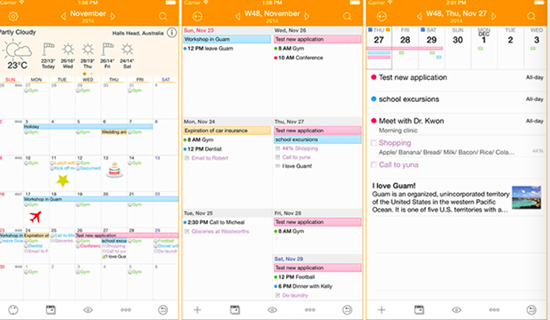 It is one of the most finest and beautifully crafted calendar apps on the App Store. Cal has simple and gorgeous interface for its iPhone users. If you want to go somewhere at a time you can set the reminder and it will show you the suggestion of the easiest way to reach via navigation, and if you have planned in your schedule to wish somebody on the birthday then it will show you suggestions to call or text them. It is free calendar app available on iOS platform. 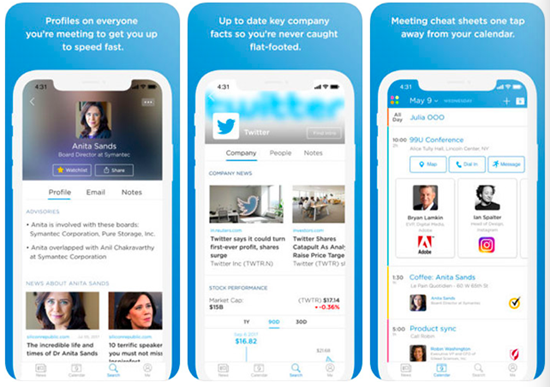 Accompany is not just a calendar app for your iPhones and iPad, as the app combines calendar and contact management in the most easiest way. There two main feature which makes this app wonderful is newsfeed and rich calendar. It has newsfeed you can get updated about what going on in the world. It has the user base of more than 250 million people. And the best part of this app is that it is absolutely free, which you can download directly from the App Store. 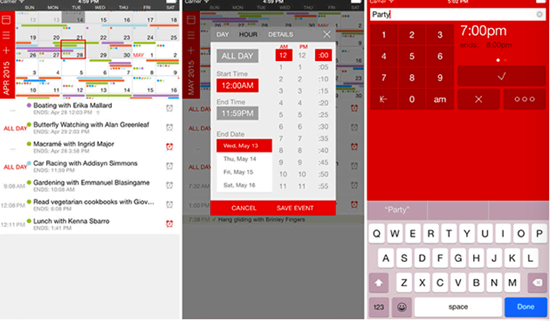 It is a functional calendar app that comes with many features. You can use gestures to manage your events in a very easy and interesting way. It also allows you to hide and show calendars so that you can keep your plans secretly. If you want to use this calendar app it can be downloaded from the App Store and it will cost you $2.99. 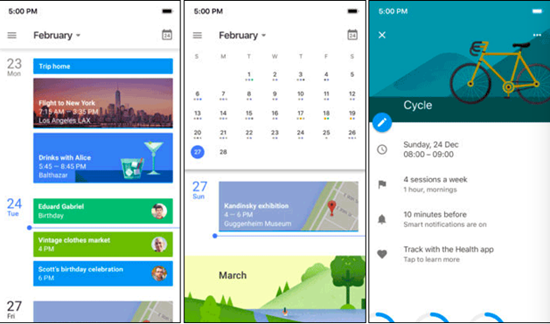 So, these are the best calendar apps with which you can manage your schedule, create the plans for the day, create a reminder and lot more. Some of the listed app are free and some of them are paid. You can download these apps from the App Store or by clicking on the links given. Hopefully now you will be punctual and able to manage all the events and works effortlessly. Do let us know which calendar app you like the most and which calendar app you gonna use. If you have any question or suggestion, welcome to leave a message in the comment below.